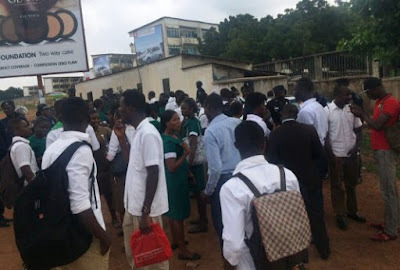 A number of unemployed nurses and midwives who have completed their studies but are yet to be employed by government, yesterday picketed at the seat of government – the Flagstaff House – to impress upon the government that they needed employment. The visibly aggrieved uniformed nurses and midwives, numbering about 400, gathered at the Flagstaff House as early as 7:00 am to petition President Mahama to fast-track their financial clearances and postings into hospitals. The action caused panic among security chiefs who hurriedly dispatched men to the scene to protect the presidency. The picketing, which was considered peaceful, was engulfed by heavy police presence since the Flagstaff House is a security zone. ACP Timothy Yoosa Bonga, Accra Regional Deputy Commander, told DAILY GUIDE that though the trainee nurses had not informed the police about the picketing, they (police) were there to protect the picketers as well as guard the seat of government . “Even without the notification, we had to be here to make sure that we offer the necessary security protection,” ACP Bonga said. Defying the heavy police presence at the seat of government, the nurses and the midwives resolved not to leave the area until their petition had been delivered. An official from the presidency therefore spoke to them on the way forward. According to the leader of the Ghana Nurses and Midwives Trainees Association, Emmanuel Geyevo, the group had lost confidence in the government as the numerous promises the members had been given had not been fulfilled. He disclosed that some nurses who completed their training and national service as far back as 2013 were yet to be absorbed into the public sector. “After several follow-ups and picketing at the Ministry of Health had proved futile, we decided to picket at the Flagstaff House today. Those of us who completed school in 2013 and 2014 have not been employed so we decided to come and see President John Mahama today to express our grievances,” Mr Geyevo stated. He said a bond imposed on them by the health ministry not to seek employment in the private sector, had left them unemployed for the past 24months. Mr. Geyevo added that the situation had caused members of the association several inconveniences and even made them liabilities to their families. “Now we are liabilities to our families. We have been left in the house to depend on our parents and relatives. Our skills are being left to rot because we are not practising. This is also predisposing several Ghanaians to danger. We hope that they quickly resolve this issue before it gets out of hand,” one of the nurses said. The Minister of Employment, Haruna Iddrisu, Deputy Ministers of Finance and Health, Ato Forson and Victor Bampoe respectively, who met the nurses and the midwives at the Flagstaff House, managed to reach a collective agreement that they should go back and that they would get their financial clearance which would enhance their postings by October 23, 2015. “If they go against their words again like they have done in the past, we will come back and this time we will be demonstrating, not picketing,” Geyevo underscored.